In this revised and updated copy of his best-selling book, Dr. David Stoop encourages readers to celebrate the positive influences their dads had on them and to make peace with their fathers for the difficulties and problems they may have caused. "Making Peace with Your Father" offers a comprehensive look at the role of the father, a study of father-absence, and a thorough description of the impact of abusive fathers. 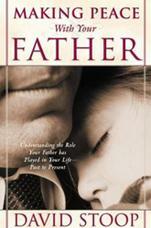 Readers will learn the 11-step process that gives hope and healing for relationships with fathers. This is a journey toward healing that all of us must take if we want to be whole whole.